Jesus said, “I am the light of the world. He who follows Me shall not walk in darkness, but have the light of life” (John 8:12). 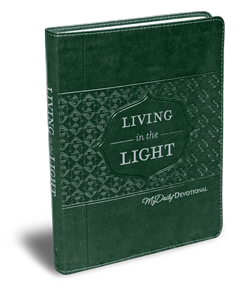 The Living in the Light year-long daily devotional book with a beautiful faux-leather cover shares the light of Jesus Christ as an example of how God desires for Christians to live. Pastor Jeff Schreve helped to write this inspiring book. We pray it will help you allow His light into your life so that others can see the light and then leave the darkness.